Gorilla African Guest House is the right choice for visitors who are searching for a combination of charm, peace and quiet, and a convenient position from which to explore Entebbe. 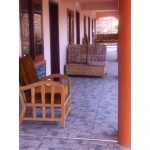 It is a small, comfortable hotel, situated in the quiet residential area of Entebbe. The hotel provides paid airport shuttle and free Wi-Fi service. 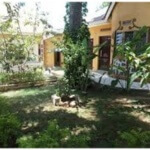 Come and stay with us in our comfortable and relaxing guesthouse. Whether you are a single person, visiting on business, or a family on an exciting road-trip through Entebbe, you will feel right at home with us. ​We are situated centrally to all of Entebbe freeways and are close (7km) to the Entebbe International Airport. If required we arrange a paid pickup and drop off shuttle service to and from the airport which is always a reassuring service when arriving in a new country. 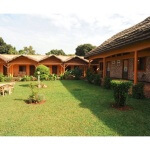 Numerous restaurants and bars are in easy reach of Gorilla Africa Guest House. Entebbe town center- 5 minutes’ drive. Victoria Shopping Mall – 8 minutes’ drive. Entebbe International Airport – 10 minutes’ drive (7 Kms). Gorilla Africa Guest House is stylish and upmarket and offers guests top class services, facilities and standards that one would expect from a leading hotel, with the informal and relaxed atmosphere that is found in a bed and breakfast establishment. Gorilla Africa Guest House promises you a comfortable stay with professional & friendly service while we also offer 4×4 car hire facilities on the same premises. The guesthouse offers a safe, secure and comfortable “retreat” for visitors to Entebbe to wake up to the happy sound of birds calling in the early morning- our large shaded grounds offer a serene, peaceful and comfortable place to relax in. Use our guesthouse as your base from which to explore the many attractions and adventures available to you in Uganda. We have the facilities to be your home away from home, while your enjoy yourselves in our wonderful country. 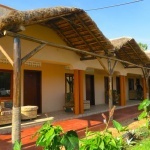 Our thatched accommodation units are designed to lend a very distinct homey feel, with contemporary amenities and hint of a tradition-rich charm that will make you lower your defenses. For example, all of our rooms exude a blend of simplicity and class. They boast practical furnishings, such as cozy bedding and spacious showering areas, and complimentary treats like a full-plated breakfast and Wi-Fi access. The guestrooms feature a variety of comforts, have their own private entrance and have ensuite bathrooms. Wi-Fi is available in all rooms free of charge and each room has a business desk from which to work from. There is a large range of DSTV channels to choose from and the rooms are provided with television LCD/plasma screen, fans, wake-up service, desk to please the most discerning guest. We have secure onsite parking for all of our guests. The bedrooms are clean, with comfortable beds with mosquito nets, with hot water shower and a sofa. The veranda just outside these rooms provides a great place to chill in the afternoon and enjoy the sunset or chat to fellow travelers. The property is filled with charming sitting areas to relax and read a book or enjoy a cold beer. From the bar and restaurant area, to the cool shade of the beautiful big mango tree, Gorilla African Guesthouse is surrounded by immaculately maintained gardens giving it a relaxing homey atmosphere. We are also easily accessible and a reliable taxi service is on call for guests wishing to commute to and from Entebbe Town and surrounds. The staff at Gorilla African Guesthouse are friendly, helpful and their enthusiasm for the comfort of the guests is reflected in the personal and prompt attention to your needs- the principal is that “A happy guest is a returning guest AND one that will recommend Gorilla African Guest House!” They are always on hand with advice, guidance and assistance whenever required. A laundry service is also available at a fee and the staff can also arrange private safari tours to various National Parks and attractions around the country (http://www.gorillaafricasafaris.com/). The onsite restaurant has a good menu of continental as well as local dishes as stews, grilled meats and fried fish and the bar is well stocked with a selection of various Ugandan cold beers and soft drinks. A high level of security includes a CCTV system that operates throughout all communal areas, and the night-security attendant ensures further security 24/7. We have secure parking for guest vehicles. We welcome a truly mixed clientele, all here with the sole purpose of having a great holiday. Whether straight, gay or undecided, we’ll do everything we can to help you have a wonderful time while you’re at our guest house.